Early on in Cloning Terror, Mitchell admits to the timeliness of his text–acknowledging the fact that the “war on terror” is still raging on the battlefield and in American media. While it is impossible to formulate a full image of this war without historical hindsight, it is common practice for scholars to critique its rhetoric. 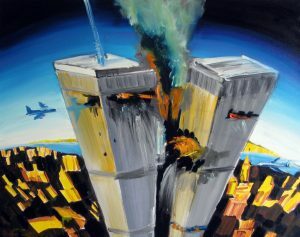 Examples include Nicholas Mirzoeff’s Watching Babylon: The War in Iraq and Global Visual Culture (2005) and Jean Baudrillard’s The Gulf War Did Not Take Place (1995). Like these cultural critics before him, Mitchell’s concept of a central image-event for the “war on terror” fails to recognize how quickly the digital revolution replaces one icon with another. As such, the image of the hooded man has lost its status to a new icon–or lack thereof–in the corpse of Osama bin Laden (who was assassinated as this review was being written). The Obama administration has reiterated that it will not release any images for fear of provoking retaliation from those loyal to the terrorist leader–similar to the uproar in the Islamic world following the release of photographs from Abu Ghraib. Mitchell draws the readers attention to the hooded man’s anonymity to explore the visual legacy of war in the age of digital reproduction, in which a nameless figure can become “as famous as advertising logos and brand icons like the Nike Swoosh or the Golden Arches.” Mitchell argues that the “the pictorial turn,” a phrase he coined in 1992, has been replaced by the “biopicture,” which occurs when an icon is “given motion and the appearance of life by means of the technosciences of biology and information.” For more than a millennium, images have been compared to life forms, but now life forms can be compared to images created by virtual and digital technologies. The spectacle of digital culture, as allowed by Photoshop, neutralizes even the most evocative images into aesthetic parody and exploitation. The crux of Cloning Terror, in chapters seven and nine, is an elaborate discussion of the hooded man’s iconic status, as created via digital and virtual technologies. The “point-and-shoot”-style digital camera used to capture the Abu Ghraib photographs is the same kind of camera used to take family photographs–images that easily become part of a virtual global network through turn photo into painting. As such, the Abu Ghraib archive offers an intimate historical view of prisoner treatment, guards’ actions and the impact of American policy during the “war on terror,” which President George W. Bush argued, “nobody wants to see.” (159) Following this visual rhetoric of torture, Mitchell suggests that the prison guards’ lack of civility mimics traditional Christian iconography of shame and redemption found in such Renaissance masterpieces as Fra Angelico’s Entombment of Christ (1438-40). With opens arms, in a gesture all to similar to that of the hooded man, a dead Christ accepts the punishment of his accusers all in the service of redeeming the sins of the world. However, unlike the religious scriptures narrating Christ’s life and miraculous deeds, the hooded man remains a mystery. Mitchell stresses that despite being inanimate, by embodying intentions, desires and agency, the photographs bring to life the tortured detainee in the viewer’s consciousness.